At P.A.W.S. 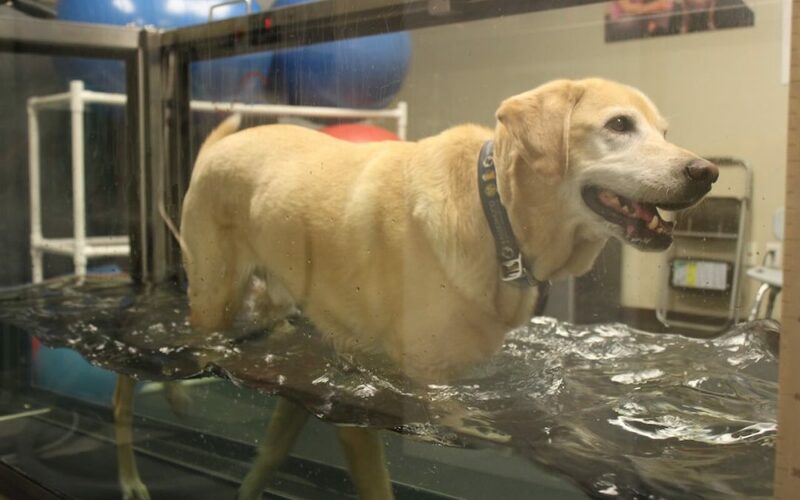 for Rehabilitation, aquatic rehabilitation is performed using the most advanced canine hydrotherapy equipment. It is extremely beneficial in the treatment of a wide range of conditions in dogs. Exercising in water provides the advantages of buoyancy, stability, and hydrostatic pressure. All of these components are good for the post-operative, arthritic, neurologic, debilitated, and/or geriatric dog. Rehabilitation with water has many benefits. One is decreased weight bearing through the joints, which reduces pain. In the water, gentle range of motion of all four limbs is accomplished and strengthening is provided by the water resistance. Neurological re-education for muscles occurs because they are used differently and reflexes can be used to relearn movement. We have never had a patient who wouldn’t use the Underwater Treadmill. Many owners are concerned their dogs don’t like the water and therefore won’t benefit or will be too scared. We progress at every dog’s particular pace and never make them do anything they are not comfortable with. We go in the treadmill with every dog to help support and reassure them. This comforting environment allows them to feel safe and enjoy their sessions!